Please excuse the crappy photos. It seems it is difficult for me to focus before I’ve had coffee–the camera and otherwise. But hey, a rainbow dress! Finished and on time! 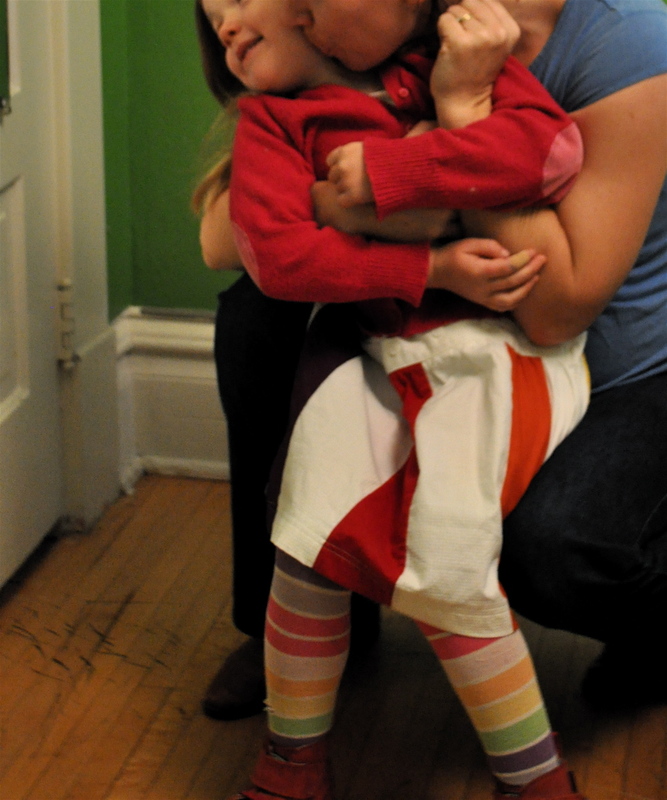 My little girl is five today. It seems a long time ago that we took a tiny little baby home to our Chicago apartment. She’s grown into a very organized kindergartener, prolific artist, helpful big sister and a beautiful little girl. 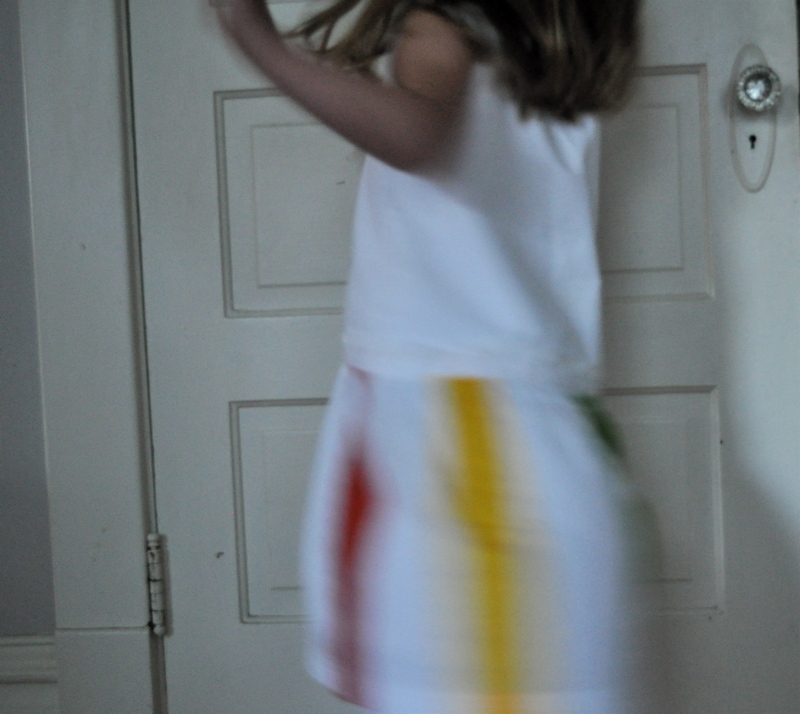 Her favorite colors are pink and rainbow, so of course I had to make a rainbow dress. I had a bunch of ideas about how to make the rainbow all cool and modern, but in the end I just went for straight forward and simple. And she loved it. 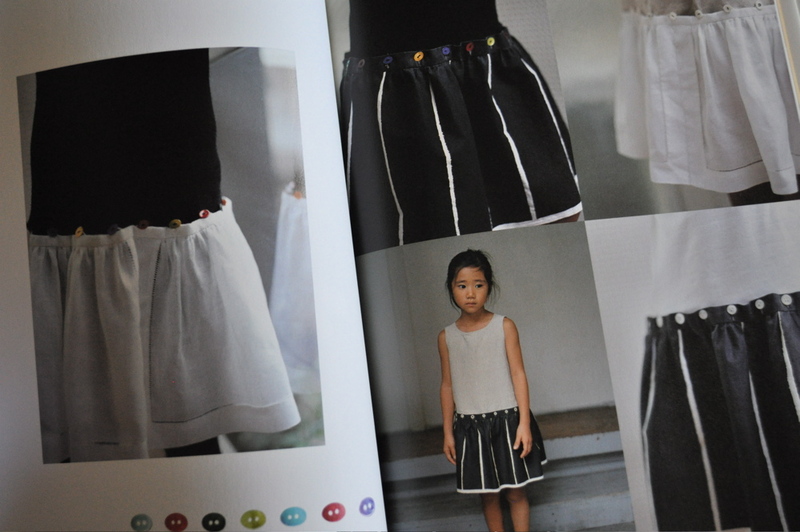 The pattern for this dress came from this japanese book (sorry I have no idea what the title is). 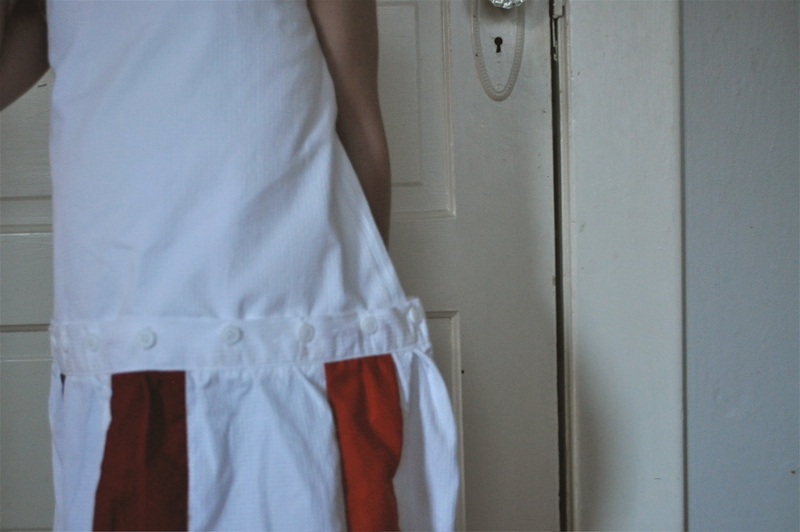 It’s a clever design: the top has buttons sewn around the hem and the skirt has buttonholes all along the waistband. And now that I’m thinking about it, this would be a great way to repurpose a button up shirt. I might buy a long sleeve shirt and sew buttons on the bottom to turn it into a winter dress, but it will be a while before I have the urge to sew 18 buttons on anything. How does one accessorize a rainbow dress, you ask? With rainbow tights of course (and red high tops). your rainbow dresses are so beautiful. well, meg, you did it again, what a perfect little dress and happy birthday to your sweet girl! Ooooo. I love this. And not just for a child. I might try the upper right photo in the collage for myself. That is so cute! I love it! I also really like the crown you made for her! Hope you all had a wonderful birthday! okay, totally cute dress (and i love her choice of tights). there’s just something about rainbows, right? and here’s a crazy coincidence – it’s sadie’s birthday today too. october 6th. how funny! all day i’ve been thinking about being in labour six years ago, and here you’ve probably thought back to five years ago. what a funny, funny world. It turned out so cute! Happy Birthday! Great Dress Meg! Happy birthday to your daughter! My curly girl will be turning 5 in a few weeks, so thank you also for the ideas! very cool. congrats to you and the little one. Happy Birthday to your precious five year old! I love the dress! Hope you guys have a blast with celebrating her wonderful five years! Meg! Brilliant! 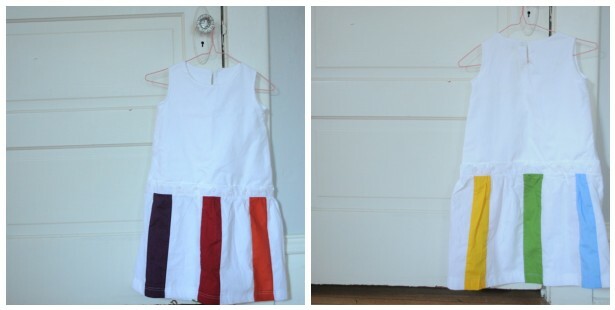 My middle daughter has been asking for a Rainbow Dress and I’ve been thinking I’ll put aside some time to think of one after her birthday in early Nov. Then you made this and it is perfect! I think she’ll really like the rainbow bands AND rainbow buttons all along the waistband. Thanks for the inspiration! If I were a little girl, I could NOT think of a better way to dress! Love it! Happy Birthday! What a fantastic idea. And with buttons the colors could rotate. Way cool. Last year, my daughter teaches me her favorite flavor is “pink”. And now, I learn “rainbow” is a color!! Just lovely, the girl and dress, both. WOW!! HAPPY BIRTHDAY ALL THE WAY FROM ALASKA!!! Love it! My 4yo’s favourite colours are purple and “rainbow” so I’m sure she’d be wanting both the dress and the tights if I were to show her this post which I won’t because I’m still working on the rainbow quilt I started making for her birthday (which was in July but I had a baby in June so things slowed down around here considerably and I wasn’t fast to begin with). I love this dress! What ages can this dress be made in? I have a ten year old girl and a two year old one. love it! isn’t 5 great? !